1618 AD: The thirty-year war has begun. The German small states (provinces) are split into Catholic and Protestant sides. But more than religious, power and political interests lead foreign powers to intervene. Wallenstein, named "des Kaisers General", Count of Pappenheim and also the Swedish king Gustav Adolf are all taking part in the conflict. No matter which side they support, everyone tries to get the most for himself. Players begin the game occupying a number of provinces (depending on the number of players in the game). A game covers two years. A year consists of the year start, the action phase of spring, summer and autumn and the scoring phase of winter. The game takes place in the five regions of Germany: Brandenburg, Kurpfalz, Sachsen, Österreich, and Bayern. Each region consists of nine provinces. In the two player game, the Brandenburg and Kurpfalz regions are not used. In the three player game, eight provinces (Holstein, Bremen, Burgund, Bm. Lüttich, Steiermark, Tirol, Fm. Bayern, and Bm. Konstanz) are not available. Players begin the game with 18 gold (2 or 3 players), 15 gold (4 players), or 13 gold (5 players). Finally, the cube tower receives an initial filling. For this purpose, 7 armies from each player and 10 neutral peasant armies are thrown at one time into the tower. The cubes that fall in the cup are placed back in player or peasant supplies. 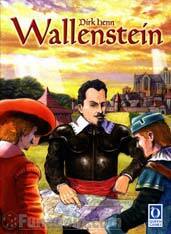 Wallenstein was designed by Dirk Henn and published by Queen Games (2002). You can view Queen Games' page on the game here. fine retailers around the world.